Click arrow above, listen, see illustrations below. Enlil, Commander of the goldmining expedition from the planet Nibiru to Earth, made sure we Earthlings couldn’t live the hundreds of thousands of years Nibirans could. He and his cohorts denied long life to us, except for a very few. They kept longevity from their half-breeds. They even denied longevity to the Sumerian King Gilgamesh of Uruk, who was 3/4 Nibiran. Gilgamesh’s father, Banda, married Ninsun, daughter of Enki and Ninmah. Banda and Ninsun begat Gilgamesh, who was thus Enki’s grandson. Gilgamesh boasted, “I’m three-forth god.” (as genetically-pure Nibirans called themselves). 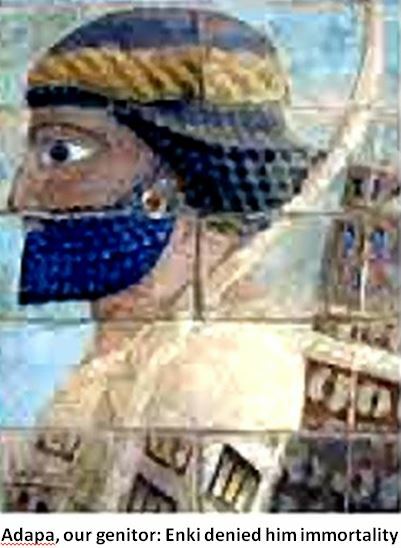 In 2500 B.C., Gilgamesh provoked riots in the Capitol of Sumer, Uruk, fief of Commander Enlil’s granddaughter, Inanna, and home of Ninsun, daughter of Enki and Ninmah. Inanna insisted on worship from the people of Uruk. She held instant life-death power them all, even King Gilgamesh, who served at her pleasure. The rest of the year, Gilgamesh loosed his lust on Uruk’s brides. He made any he fancied couple with him before their husbands could. Enki, a great geneticist, created Enkidu in his lab. Enkidu was a huge, powerful man, strong enough to challenge Gilgamesh and distract him from his sexual rampages. Gilgamesh developed his strength as an animal in the wilds. Before he could send Enkidu against Gilgamesh, he needed to tame and civilize him. So Enki sent tantric priestess Shambat to tame Enkidu. Enkidu challenged Gilbamesh. They fought, then befriended each other. Gilgamesh and Enkidu, with a map from Ninsun, sailed, rowed and treked to the Landing Platform at Baalbek in Lebanon to beg the gods to rocket him to Nibiru for immortality he thought they enjoyed. In Lebanon, Gilgamesh and Enkidu tracked Enlil’s security robot to the Launchpad. They watched a rocket launch, and tore the grating off an air-shaft tunnel they thought could lead them to the pad. 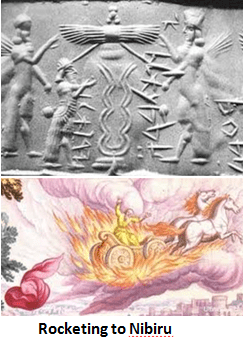 Inanna, from her plane, saw them smash Enlil’s robot. “At the entrance to the Cedar Forest its fire-belching monster, Huwawa, their way blocked. Inanna flew her plane overhead in time to see Enkidu hit Huwawa’s groin with a tree he picked. Then Enkidu jumped back and ran. She “cast her gaze upon Gilgamesh. She had never seen him fully naked in daylight before. ‘Approach me,’ she said.‘ She “raised an eye at his beauty. “Come, Gigamesh, be my lover,’ she said sultrily. She took off her clothes and held up her breasts as invitation. “Gilgamesh, lover of many women, was stunned by her beauty. He too had never seen her thus naked in daylight. “‘Oh Ishtar, holy Irnina,’ he said as he went down on his knees. He grabbed her extended hand. “How I’ve craved you, desired your warm loins, dreamt of your luscious lips.’ He kissed her hand fervrenly. “‘Come then.’ She bent down, lowering her breasts toward his lips. Just then, out of the grating he and Enkidu had removed, they heard The Bull of Heaven bellow from the cave in which the grating had confined it. “She put on her clothes and walked back to her skyship. “Now be gone and be damned,‘” she said. Gilgamesh’s mother, Ninsun, told of a life-prolonging plant that grew in Sinai, near the Spaceport, that gave immortality to Ziasudra-Noah and his wife. 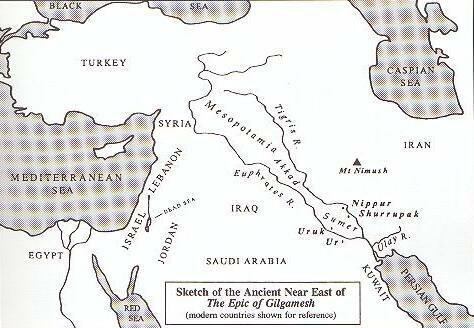 Ninsun gave Gilgamesh and Enkidu a map, and they set sail to Sinai to get the plant. A Nibiran guard, however, sunk their ship and the immersion in salt water ruined Enkidu’s circuits and he died. Gilgamesh grieved his friend. Then Gilgamesh went to the spaceport in Sinai for a plant to let him live forever. Enroute, he killed two lions and dressed in their skins. 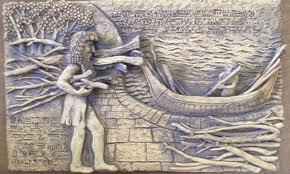 In a tunnel in Sinai he met Enki’s son, Ziusudra/Noah, still alive all these centuries. “Ziusudra to Gilgamesh the secret of longliving he revealed a plant in the garden’s well was growing, Ziusudra and his spouse from getting old it prevented.” Enki, with Enlil’s permission, said Ziusudra, granted Gilgamesh this plant too. But when Gilgamesh got the plant, a snake snatched it from him. As a last resort, he begged Enlil to grant him immortality. * In the Sumerian literature I perused, I could not find the conjugation ritual Sitchin describes in the above account. Sitchin may have created it as fiction to juice his story or he had sources of which I am unaware. Around 200,000 BCE, one of the periodic approaches of the planet Nibiru to the inner solar system upset Earth’s climate and ruined the new crops. The hybrid Earthlings that Enki (Chief Scientist for the goldmining expedition to Earth) had adapted from the Nibiran genome (he added a few Homo Erectus genes) foraged afar in Mesoamerica but made less food. In his African reserve, “Enki in the marshlands looked about. With him was Ismud, his visier, who secrets kept. “On the river’s bank, frolicking Earthlings he noticed; two females among them were wild with beauty, firm were their breasts. Their sight the phallus of Enki caused to water, a burning desire he had. One of the girls bore a boy, ADAPA; the other, a girl–TITI. Enki kept his fatherhood secret. Adapa and Titi mated and she bore the twins, Ka-in and Abael. Enki’s wife, Damkina, “to Titi took a liking; all manner of crafts was she teaching. 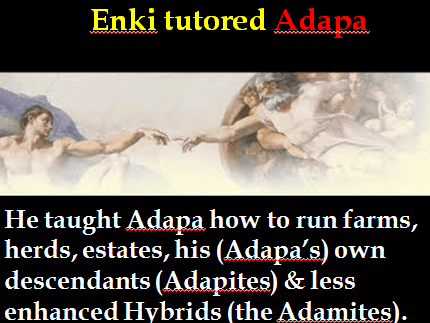 Enki schooled his (albeit clandestine) son Adapa. He had Adapa then teach his descendants–the enhanced Earthlings–to run farms, herds, estates and how to run less enhanced Earthlings. Enki brought more Earthlings from Africa to Sumer for Adapa to train for the Expedition bosses’ homes and facilities. Adapa trained and oversaw the workers Anunnaki brought from Africa to work the bases in Iraq. He watched over bakers, water system workers and fishermen and made sure they supplied the Anunnaki and fed themselves Adapa kept the stats—he was in charge of offerings to Enki. Enki told Adapa that royals on Nibiru ate “The Bread of Life” and drank ‘The Water of Life” to live hundreds of thousands of years. Without those substances, Enki told Adapa, he’d die in a thousand years. Adapa, of course, begged Enki for the Bread and Water of everlasting life. But Enki said only King Anu, back on Nibiru, could decide whether to give him the substances. The King sent Ilabrat, his Vizier, to Earth for Adapa. Enki gave Ilabrat Adapa. Enki sent his two unmarried Earth-born sons, Ningishzidda and Dumuzi, with Adapa to meet grandfather, Anu, and maybe find Nibiran wives. 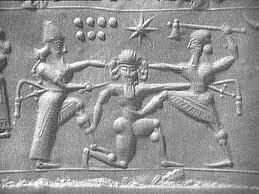 On Nibiru, Ningishzidda slipped the King a sealed tablet from Enki. Enki, on the tablet, said he wanted Adapa to breed more enhanced Earthlings. Enki confessed he enhanced Adapa and Titi; he’d impregnated adapted Earthlings descended from Adamu and Ti-Amat. Ningishzidda already knew, from Adapa’s DNA, that Enki begat Adapa and Titi. The tablet asked Anu to deny Adapa food or elixir “the Bread of Life” (probably monoatomic gold, the “Manna from the Heavens”) and the “Water of Life” that would lengthen the lives of Adapa and his descendants. The Earthlings descended from both Adam (Adamite hybids) and Adapa (Adapites), Anu knew, descended from him as well. Enki and Ningishzidda–Anu’s son and son’s son–via their seed, passed Anu’s genes to the Earthlings, mixed with their DNA with Homo Erectus’ and created an illegal civilized species. Enki wanted Anu to deny Earthlings the seeming eternal, lifespan Anunnaki had, so the illegal species would stay long- quarantined on Earth. Ningishzidda flew to Earth with Adapa and grain seeds. Ningishzidda would teach Abael animal care so he could help Dumuzi when he too returned to Earth. When Dumuzi returned, however, Marduk pre-empted Abael and the animal project for the Enkiites. Enlil had Ninurta tutor Ka-in to raise grain Ningishzidda brought. Enlilites, not Enkiites, would run Earth’s farming. Ninurta taught Kai-in, Marduk taught Abael. The twins quarreled an entire winter. They argued whether Ka-in’s grains and fish-filled water canals or Abael’s meat and wool gave most. Enki took Ka-in to Eridu, where the senior royals (The Seven Who Judge) met decide Kai-in=s fate. The Enlilites in the meeting–Enlil, Ninki, Ninurta, Nannar and Marduk wanted Ka-in killed. Marduk, at first agreed Ka-in should die for killing Abael, the Expedition’s animal breeder-designate. 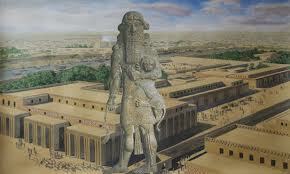 But Enki, Marduk=s father, said he begat Ka-in’s father Adapa. Marduk then accepted Ka-in as his own grandnephew. Ka-in’s survivors planted grain. They founded and ruled the city of Nud [also called Dun, Dunnu and Nu.dun]. Ka-in’s successors for the next four generations murdered their fathers. 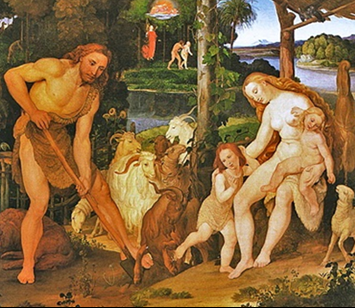 For the next three generations after that, each ruler of Nud killed his parents, married his sister, then ruled. In addition to Abael and Ka-in, Titi bore thirty sons and daughters to her brother Adapa. Nibirans divvied them up and taught them to write, do math, dig wells, prepare oils, play harp and flute. Nannar made Adapa’s descendants priests. The priests led rituals for the Earthlings and taught them to support, obey and worship Nannar and the other Anunnaki as gods. Enki taught astronomy to one of his own descendants, a hybrid Anunnaki-Adapite named Enkime. Marduk rocketed Enkime to the Moon and Marsbase, then to the Spaceport at Sippar to oversee the Earthlings there for Utu. Enki took Ka-in to Eridu, where the senior royals (“The Seven Who Judge) met decide Kai-in’s fate. The Enlilites in the meeting–Enlil, Ninki, Ninurta, Nannar. Marduk, at first agreed Ka-in should die for killing Abael, the Expedition’s animal breeder-designate. But Enki, Marduk’s father, said he begat Ka-in’s father Adapa. 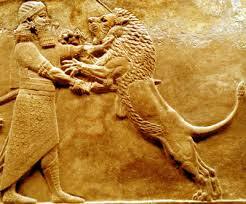 Marduk then accepted Ka-in as his own grandnephew. After she bore Abael and Ka-in, Titi bore thirty sons and daughters to her brother Adapa. Among themselves, the Anunnaki distributed these kids and taught them to write, do math and astronomy; they taught them to cultivate crops, husband animals, dig wells. They taught these “Adapite” kids to make oils, euphoric intoxicants (“elixir from the Ibu fruits”—probably grapes) and beer from barley. The Adapites learned to build furnaces and kilns, smelt and refine bitumens, play harp and flute. Nannar made some of Adapa’s descendants priests. The priests led rituals for the Earthlings and taught them to support, obey and worship Nannar and the other Anunnaki as gods. Enki taught advanced astronomy to one of his own descendants, a hybrid Anunnaki-Adapite named Enkime. Marduk rocketed Enkime to the Moon and Marsbase, then to the Spaceport at Sippar to oversee the Earthlings there for Utu. I would love to hear you as a guest on the radio show, Coast to Coast AM. Have you ever thought about doing that? George Norry is a great admirer of Stitchen’s work. I am emailing Coast to Coast to suggest that you be a guest on his show, I know he gets thousands of E mails, But I’m hoping it will catch his (or someone who works for him ) eye.